With its superior extra-refined, high-density graphite, high point strength, break resistance, and smearproof lines, the Mono Professional is the ultimate instrument for drawing and drafting. It uses the exact same lead as the Mono 100, a professional pencil that is the gold standard among artists and animators. Set of 6 w/ Eraser — This set includes six pencils in a variety of degrees, including HB, B, 2B, 4B, 6B, 2H, plus a Mono Zero eraser. Set of 3 — This set includes three pencils in a variety of degrees, including HB, 2B, and 4B. Class Pack, Set of 150 — Class Pack — This set includes 25 each of HB, B, 2B, 3B, 4B, and 6B drawing pencils. Set of 12 — This set includes 12 pencils in a variety of degrees, including 6B, 5B, 4B, 3B, 2B, B, HB, F, H, 2H, 3H, and 4H, plus an eraser and pencil sharpener. To view a PDF showing step-by-step instructions for drawing a feather with the Tombow Mono Drawing Pencils please click here. 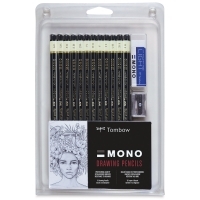 Tombow Mono Drawing Pencils are the ultimate instrument for drawing, animation and drafting. These pencils offer extra-refined, high-density graphite with break resistance, and smearproof lines. Mono Professional pencils use the exact same lead as the Mono 100, a professional pencil that is the gold standard among artists and animators.